This centrally located hotel boasts good standards of accommodation and is a popular adults choice. It is well situated just a short stroll from the glorious golden sandy beach with its great range of activities. The hotel was the cleanest hotel we have ever stayed in the maid service was fantastic they cleaned the rooms everyday. Food was excellent with a wide variety of choice even a childs buffet. The hotel was in a prime location on the main shopping street and you are within 5 minutes to the lovely albena beach. The hotel staffs are very friendly nothing is to much trouble there was at least 2 lifeguards on duty all the time they not only kept watch but also kept my 3 children and everyone else very well entertained. There was a bar infront of the hotel for all the family. 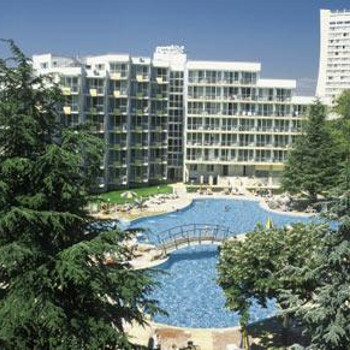 The hotel Laguna Garden in Albena Bulgaria is an excellent place to stay for all age groups. The food was very good with plenty of choice. It is spotlessly clean as was the pool area. The staff were all very friendly and helpful. It is less than five minutes walk from the beach. I went there with my daughter and two grandsons aged ten and twelve and they loved it. After our evening meal we went out so I can only comment on the entertainment on the little we saw but it seemed quite good. We were four sharing a room so we did not have a lot of space for our clothes but we did not find that too much of a problem. We would definitley go there again. This hotel is excellent. It was meticulously clean everywhere including the pool area. The staff can not do enough for you. We were expecting quite a poor standard of food as there were bad ratings on this site but we found it to the contrary! There was so much choice I don't know how anyone could fail to find something they liked. There was no entertainment on site but we did not find this to be a problem. Having just arrived back from Laguna Gardens we would recommend this hotel very highly. As with the Carter family we were concerned about the standard of the food but there was no need. Both my son and myself are very fussy eaters and we both found plenty to eat, the food was always hot and the kitchen staff always making sure the food was continually topped up. The hotel it's self was spotless, we even saw the cleaners way after midnight cleaning the reception area. The staff was very helpful and nothing was ever too much of a problem. The staff around the pool were also excellent and were very helpful and very friendly.The pool area was well used but never seemed to be noisey. There wasn't any entertainment but there was a darts board, pool table and computers in the bar area which you could pay to use for either the internet or games. Location was just right as well, a short walk from Craft Street and a few minutes away from the beach. An excellent overall holiday and we would go back again.